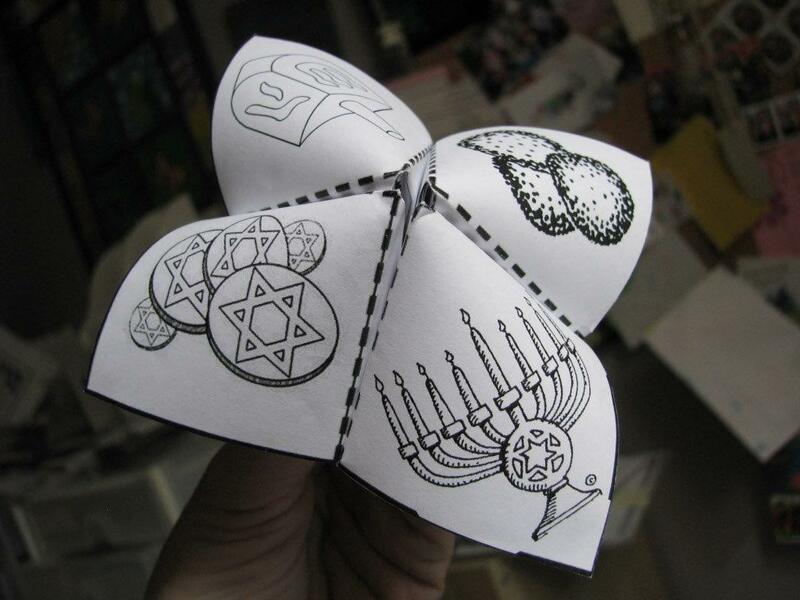 I remember making and playing with paper fortune tellers (also known as chatterboxes or cootie catchers) when I was a child. Earlier this year my daughter brought one home from primary school, proof that while much has changed since my childhood, much also remains the same. 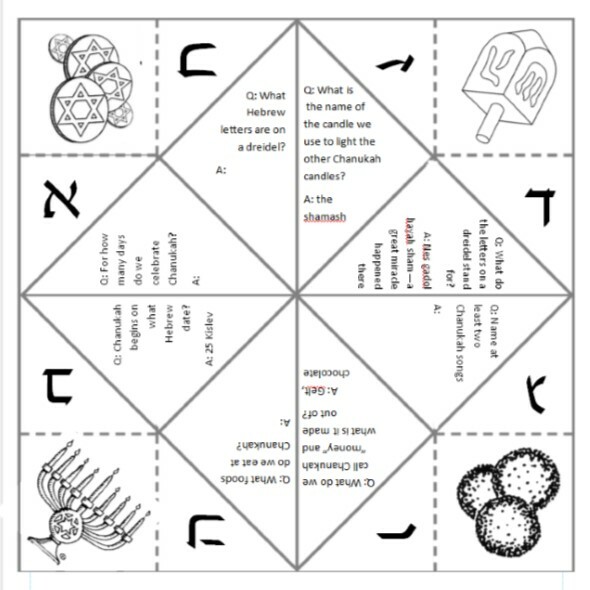 I was struck by the possibility of combining the eight internal faces of the chatterbox to the eight nights of Chanukah, an idea which I’m sure has many more possibilities than the simple one I have settled on for class this weekend. I found a template online (google “chatterbox template” and you’ll see many) and filled it in. Depending on the age and ability of your children, and the amount of time you have available, they could fill it all in themselves, but this guarantees a minimum standard of completion and legibility! Black and white diagrams can be coloured in, children can practice the first eight letters of the alef-bet instead of counting to eight, and underneath each letter is a question relating to the festival. I left half unanswered so they can do a bit of work themselves before taking their new toy home and quizzing their parents. Instructions on how to fold a chatterbox can be found online – thank you again google. 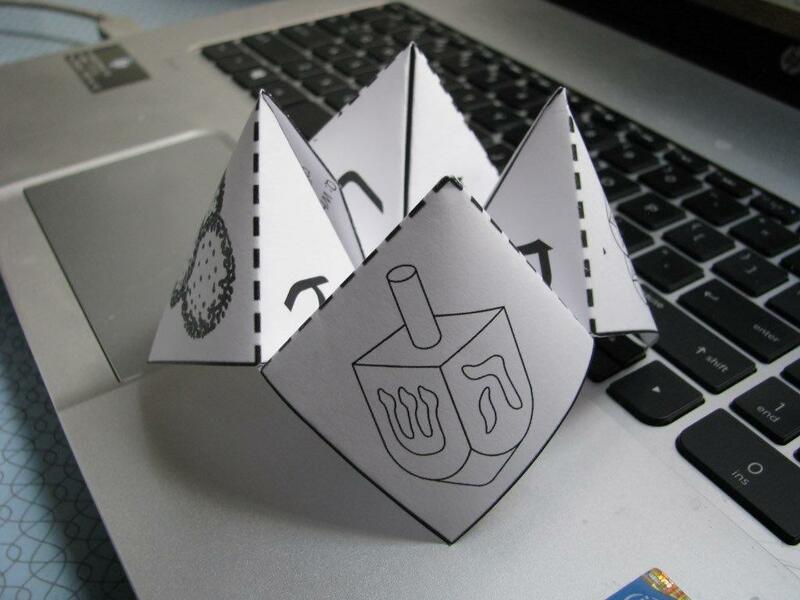 You can download a printable pdf of my Chanukah chatterbox here. Or be brave, go make up one yourself!